People say there's no more miracles in today's world. Sure there's people who claim they can heal the sick or turn water in to wine, but in general our miracles of today tend more towards bearded faces in peanut butter. You'd think this would make it tough to maintain faith in the "Show me the money!" world that we live in, but I'm fortunate enough to not have this problem. Every morning my faith in God is restored when I witness a true modern day miracle - my kids getting out of bed and off to school on time. OK, maybe it doesn't rank with the feeding of five thousand, but getting my kids to stop sleeping is no easy chore. 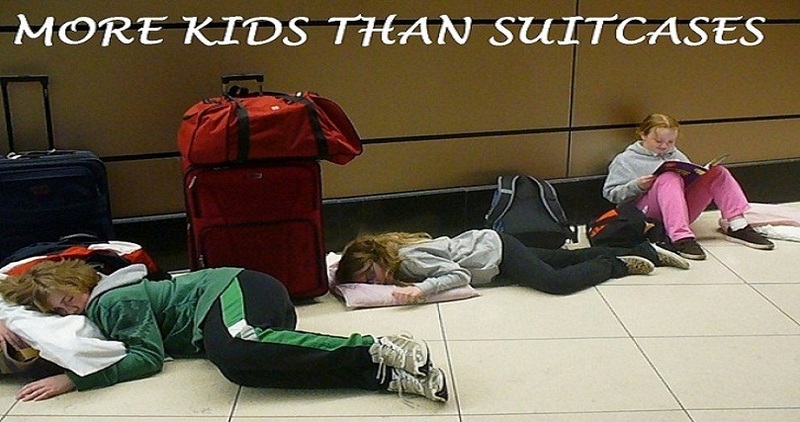 They love their ZZZZ's, but this can present a bit of a problem when we're traveling. Between time zone changes, early morning flights, and having to share a room with a certain snoring member of the family who shall remain nameless (but who does have the power to edit any comments posted on here), it can be a bit of a battle to keep up with the recommended eight hours a night. Luckily, as demonstrated by our title picture, our kids are willing to adapt and work hard to make sure they meet that eight hour goal. If only they'd put as much effort into getting their homework done. The picture that heads every page on this website, was taken in the car rental center of Las Vegas at the unfathomable hour of 8:04am. Granted, 8am is probably a little more unfathomable in Las Vegas than in other cities, but I'm pretty sure nobody in this picture is trying to sleep off the previous night's activities. Still, there was an opportunity here to add a few minutes towards the eight hour goal, and apparently two of my three children decided that their minimum requirement of a level surface and a pillow had been met. I'm sure my other daughter is studying her homework. Of course, the real value in the ability to sleep anywhere comes in hotel rooms. If we're staying anywhere for more than a night, we usually either get a suite or a second room, but it's those one night stays where you really just need a place to crash for a few hours that don't seem worth spending a ton of extra money on. Here we can simply grab a standard room, and anybody who doesn't want to share a bed can find a chair/counter/closet/bathtub/spot on the floor (Yes, we've used all of those at one time or another.) and spread out as much as they want. It's probably not as good as having your own Simmons Beautyrest, but it should get you at least half way to your eight hour goal. The rest of the needed sleep, has to be found on the road. Each of my kids has a slightly different way of going about this. My youngest daughter is the most flexible. She can sleep almost anywhere, as long as there's a pillow and a stuffed animal. Planes, cars, shuttles...it makes no difference to her. If there's a pillow and a stuffed puppy, she's good to go. My older daughter has mastered the art of sleeping at airports. She doesn't even need those (really great) seats with no arms between them so she can lay down. Any chair will do as long as it's relatively quiet and not next to her sister. Nothing puts the brakes on a good nap like a loud game of "She's on my side!" The boy is more of a ground transportation kind of person. Shuttles, buses and vans are prime hibernating time for him. He's also been known to have a fondness for a good deck chair, yet for some reason, he can't sleep on planes despite almost always having a window seat. This makes it a little harder for him to get his eight hours in, but my son does have a sleep super power....There is no church service that he can't sleep through. Seriously, I've thought of having him tested to see if he was hypnotized at a young age and now the phrase "Please bow your heads" puts him under. I suppose he needs to catch up on his sleep somewhere, but this just doesn't seem like a very good idea. For a kid who counts on a Divine miracle to get him out of bed and off to school each morning, this might just be pushing his luck.